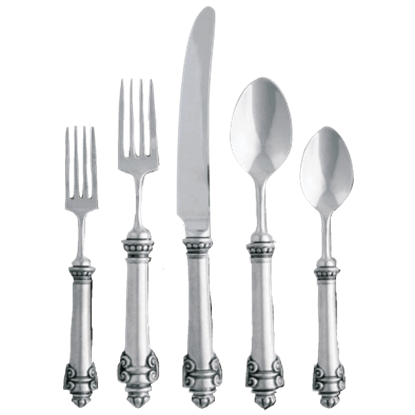 We define flatware and silverware by similar standards. So if you find yourself in dire need of some new silverware, the place to look is here, in our fine dining flatware section! We offer a tantalizing array of intriguing options, allowing you to add theme and style to your next meal, whether it is a casual meal among friends or a formal affair among business associates! 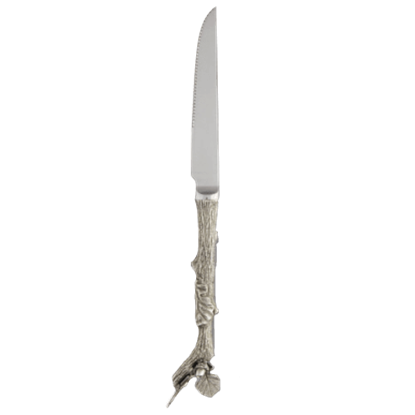 One of our themed pieces of flatware include renaissance inspired pieces that draw on the style of the noted Medici family, offering a subtle touch of artistic appeal to your silverware. 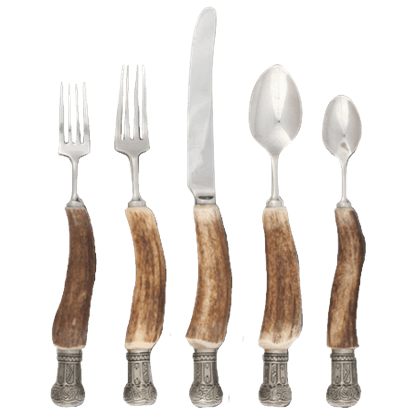 Another few sets are inspired by more natural origins, depicting full flatware sets that have antler handles. One features genuine shed antler grips, while another sports cast pewter grips modeled after traditional antler. Some have an undersea style to them, with corral grips, while others are more forest themed, possessing pewter grips textured with bark and shaped like oak branches. We offer flatware sets that include the five traditional pieces, those being a butter knife, dinner fork, salad fork, soup spoon, and teaspoon, as well as steak knife sets that are ideally suited to helping you carve choice cuts of meat on your plate. 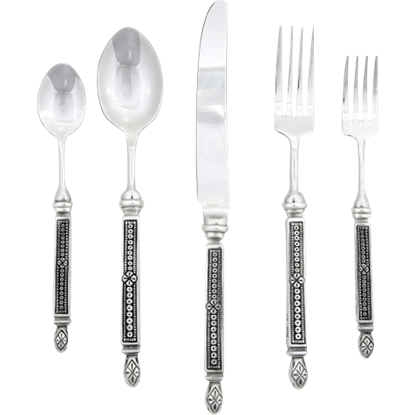 Pair these flatware sets from the fine dining section with a few other pieces from our collection and your guests will not just be talking about the food after dinner service is completed. They will be talking about the utensils they ate it with too! 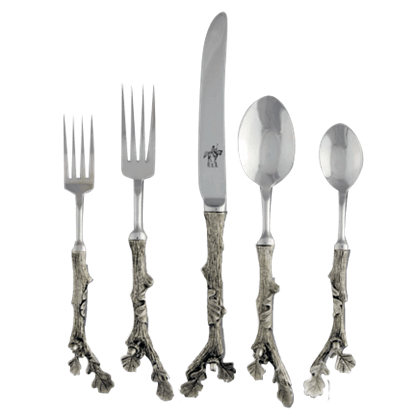 The 5 Piece Antler Flatware Set brings elegance and nature to your table. This cutlery collection features natural, hand-gathered antler that enrobes the handles. Each handle is capped with a lovely pewter crown. Artistic, intriguing and captivating, the 5 Piece Medici Flatware Set adds elegance to any occasion and is at home on the most formal of tables. The perfectly weighted pewter handles feature beautiful cast design work. The beauty of nature inspires art of all kinds, including the craftsmanship seen in the cutlery on your dinner table. 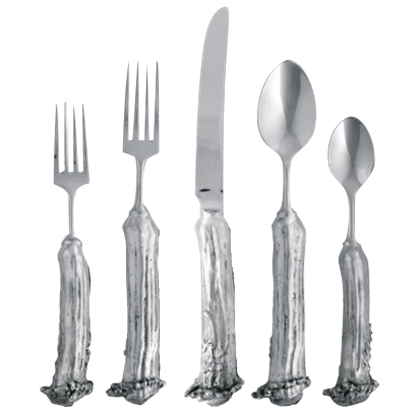 The 5 Piece Acorn Flatware Set is cast to resemble slender oak branches with excellent realism. Featuring pure, luxury pewter handles, the 5 Piece Provencal Flatware Set brings Mediterranean design to your dinner table. The handles of the designer utensils display patterns inspired by traditional Provencal linens. 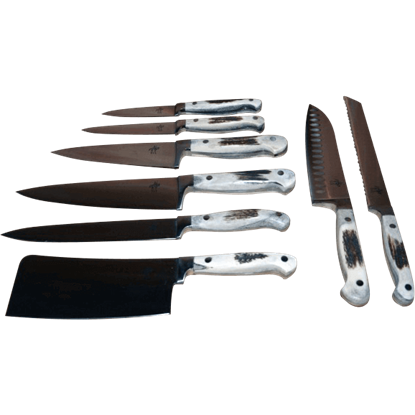 Learning and experienced chefs can show off their cooking skills at their next dinner party with the help of these high quality kitchen knives! 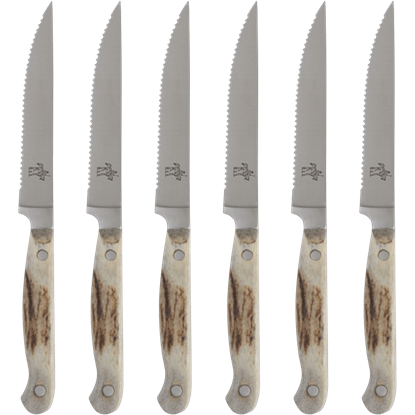 The 8 Piece Antler Handle Kitchen Knife Set comes with eight different knife types. For the ultimate personal carving experience, you need the Acorn and Oak Leaf Steak Knife Set in your home. This steak knife set combines functionality with timeless beauty in its intricate, nature-inspired design. Prepare for your next dinner party with the addition of the Lodge Style Steak Knife 6-pack with Leather Pouch to your table setting. These high quality meat knives make an excellent finishing touch to your rustic cutlery. 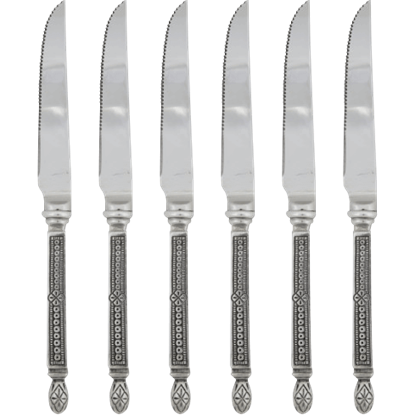 Featuring pure, luxury pewter handles, the Provencal Steak Knife Set brings Mediterranean design to your dinner table. The handles of these stainless steel steak knives display patterns inspired by traditional Provencal linens.